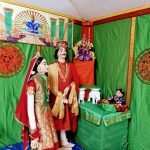 Chaitanya Mahaprabhu was a great Mahatma who spread the chanting of the ‘Hare Rama Hare Rama Rama Rama Hare Hare Hare Krishna Hare Krishna Krishna Krishna Hare Hare’ Mahamantra. 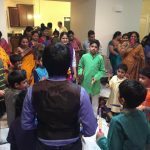 His descent on the auspicious Holi day was marked by celebration at the satsang held at Smt. 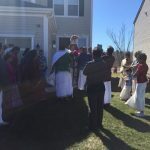 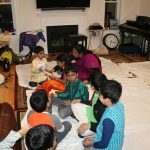 Padma and Sri Srinivasji’s residence in Westford MA on Sunday, March 19th 2017. 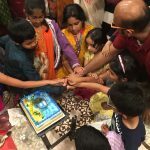 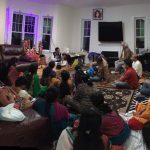 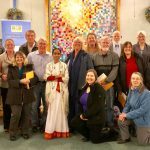 More than 60 devotees gathered at Graniteville Woods on the evening of Sunday 19th March for the satsang and celebration. 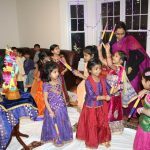 Mahamantra Kirtan and Bhagavatam recitation was conducted. 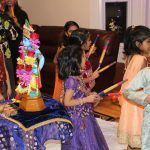 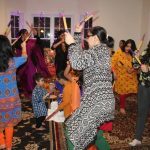 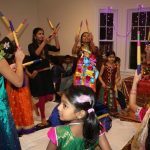 Then kids and adults who had come in their best attire danced around Lord Krishna singing Madhura Gitams in raas/ dandiya style. 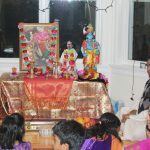 Following this, Sri Narayananji spoke on the beautiful path of Bhagavata Dharma and the efficacy of Mahamantra kirtan. 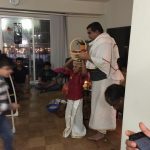 The satsang celebrations concluded with Harathi and prasad.